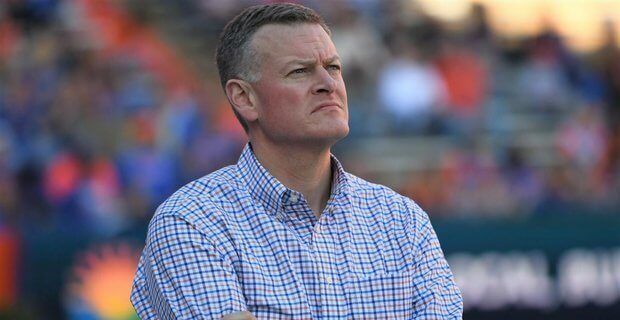 Ever a man of the people, Florida AD Scott Stricklin has heard the voices of those who want to beef up the Gators’ football schedule. And he’s doing something about it. It looks like Florida’s future football schedules are about to get much more powerful, so to speak. The Gators play in the Southeastern Conference, meaning that eight fellow SEC schools adorn their football schedule on a yearly basis. There’s also the rivalry with FSU, which adjusts the number of so-called “Power Five” opponents on a typical schedule upward to nine. Then there are a few irregular games against Power Five opponents, such as a neutral site kickoff game against Michigan in 2017 and another one in four months against Miami. And then there’s the two-for-one scheduled against South Florida, which while not a Power Five opponent, is a semi-respectable FBS school that will do far more to help Florida’s strength of schedule than typical non conference opponents like New Mexico State, Idaho, Colorado State, Bowling Green or Toledo. Yet, for many both inside and outside the Gator fan base, that simply isn’t good enough. Now, this isn’t really a new development, but it’s an important one nevertheless. Stricklin has previously suggested his desire to schedule some home and home series with fellow Power Five Conference teams, most notably in this interview with the Gainesville Sun’s Pat Dooley three months ago. So let’s travel back in time to January. Back then, all anybody could think about was the then-ongoing war of words with Central Florida’s administration (read: AD Danny White) regarding a series with the Knights, and to a secondary degree, the fact that Stricklin admitted giving serious consideration to shrinking the seating capacity in the Swamp by several thousand seats. When that interview hit the presses, not only was the topic of beefing up the non conference schedule sort of buried as a subtopic, Stricklin just wasn’t that concrete about it. But he did leave us with enough to connect some dots and make some educated guesses. Let’s revisit exactly what Stricklin said to Dooley about home and homes for contextual purposes. It will be important later. Yeah. It’s hard to do because of Georgia and FSU on our schedule. Our schedule is unique. We have unique challenges. We’ve had some conversations, but the problem is people are scheduled out well into the next decade. And because we play an SEC schedule and FSU every year you have to be really strategic as to who it’s going to be. It’s not going to be a team that’s competing for a national title year in and year our. I’d rather play those teams in the playoff. But I do think there are opportunities to play a team that makes your home schedule more interesting and then when you have to go on the road making it a place our fans might want to travel to. This is all about bringing more value to your schedule. From that, it appears that Stricklin has zero interest in scheduling home and homes with the teams that currently dominate the sport. That means you can forget about home and homes with teams like Ohio State, Clemson, Oklahoma, and probably the tier directly below those schools consisting of Washington, Michigan, Notre Dame and now maybe even Texas. And this is purely conjecture on my part, but I really don’t think Stricklin would sign a home and home contract with a school that’s technically in the Power Five but light years beneath where Florida is as a program. That line about “a place fans want to travel to” makes me highly doubt we’re looking at home and home series with schools like, say, Indiana, Oregon State, Colorado, Kansas, California or Rutgers. But cutting out the top 10% and the bottom 10% of the Power Five landscape still leaves that middle 80% of the ACC, Pac-12, Big 12 and Big 10 universe to negotiate with. And that brings us back to the present, and Stricklin’s tweet on Wednesday night. For Stricklin to come out and directly proclaim that he’s working on scheduling some neutral site games in the front half of the 20’s and some home and homes in the back half of the decade is a significant step forward from his casual approach he took with this back in January. That transition from the attitude of, “Yeah, we’d do it, but we’d have to be very strategic about who it’s with” to “I’m literally working on it at the same time that you’re using to call me out about it” hints that by now, he may not have just identified teams he’d want to schedule a home and home with, but has actually had at least preliminary conversations with some of these schools to gauge their interest levels. So, the next step is to wonder who, exactly, Florida will be signing game contracts with, and that’s where things become particularly unclear. As Stricklin noted, the way to go in the more immediate future would be to schedule some neutral site games against high caliber teams (because those often come with huge payouts for both teams), and there’s no shortage of possible opponent-location combinations one could conjure up. It is worth noting that Florida’s 2020 schedule is already filled out, and that the 2021 season already includes an additional game outside the Swamp (@South Florida), so the absolute earliest any marquee non conference games would be slated for is 2022. But really, there isn’t a neutral site kickoff game that would be a bad option for Florida. And it’s all about location. First, the Chick-Fil-A Kickoff Classic in Atlanta has an opening in 2023 and nothing scheduled in 2025 onward. No doubt this came up at least once when the brass from both Florida and the Peach Bowl spent all that time together back in December. Similarly, the Belk Kickoff Game in Charlotte has nothing set in 2022 or beyond 2023, so if Florida wanted to square off with a reputable Big 10, or a northern-half-of-the-ACC program or even West Virginia in a true “let’s meet halfway” neutral atmosphere, that would be a viable option as well. Then there are a bevy of other neutral site season kickoff options, like the two in Texas (Advocare Kickoff Classic in Arlington and the Texas Kickoff in Houston), or the Washington Redskins’ home of Landover, MD, which has hosted nonbranded neutral site openers each of the last two years and held arguably the greatest kickoff game of all time in 2010. And of course, there are literally dozens of 65,000+ seat football stadiums in the southeastern quadrant of the country that don’t already have branded, annual kickoff games but are certainly qualified to host a one-off event. It’s enjoyable for most Gator fans to think about all those possible paths to add Power Five opponents to the schedule, and it’s even more enjoyable to realize that the man who can make that happen doesn’t just think it would be cool to happen in theory, but is actively working on making it happen. I saw you tweet about this and I’m a little surprised you didn’t mention it here, but growing up in Homestead, I want Miami. Every year. Not for a one-off neutral site kickoff game, not for a rare home and home series, but every year. When I was a student at UF (Where were you in ’62?) every year started with Miami and ended with FSU. Remember George Mira?